Scenario: For some unexpected reason you need to evacuate your home immediately! You don’t have time to think. The good news is that you already made a Go-Bag and can go OTD (Out the Door) NOW. But how do you make a Go-Bag? Start today with what you have on hand. Because you never know when an emergency may hit. 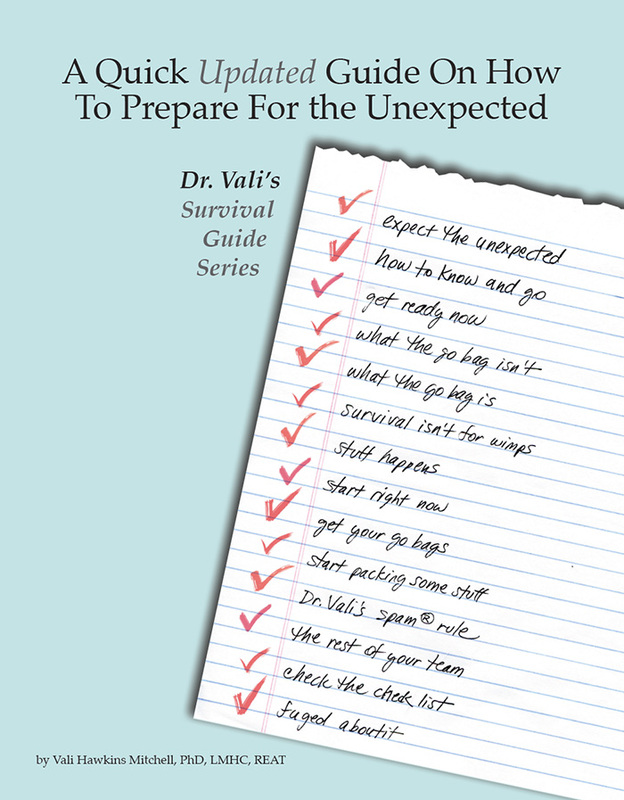 Dr. Vali’s quick-guide will get you started today without a fuss. Dr. Vali Hawkins Mitchell, PhD, LMHC, REAT, is a world traveler, author, a life coach, licensed psychotherapist in Washington and Hawaii (LMHC), Certified Traumatologist, Registered Expressive Arts Therapist (REAT), consultant, educator, author and award winning artist. She is a seasoned disaster responder and has taught emergency management professionals for decades. You can find her teaching in coffee shops and board rooms, on military bases and in hospitals, in corporate headquarters or disaster zones, hanging out with real people to offer them real solutions wrapped inside a bit of whimsy in the middle of their disasters. Her “been-there-done-that” style has made her a popular speaker and training facilitator. 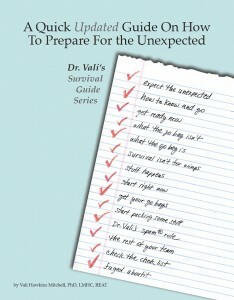 Dr. Vali is well published in several specialty areas, traditional and whimsical. Get email alerts so you don't miss out on the latest "Resiliency 4 Today" blog post!